Pregnancy is a roller coaster experience. While you get to enjoy the wonderful feeling of carrying and nourishing a life, you also have to deal with several upsetting problems. Nosebleeds, also known as epistaxis, is one such distressing problem that women often experience in the last stage of pregnancy. However, some women even experience it during the first trimester. A nosebleed means you are experiencing an unexpected sudden rush of blood out of your nose. This happens during pregnancy because the circulatory system expands to accommodate the growing baby inside your womb. Due to this expansion, your body creates more blood and the circulation of blood increases. According to the American Pregnancy Association, due to the increase in blood circulation during pregnancy, the blood vessels inside your nose are more prone to burst, causing a nosebleed (1). Other reasons behind nosebleeds during pregnancy are cold weather, dry nasal passages and high blood pressure. A 2009 study published in Obstetrics and Gynecology reports that the prevalence of epistaxis is significantly higher among pregnant women compared with non-pregnant women. Epistaxis also may be associated with an increased risk of postpartum hemorrhage (2). Normally, nosebleeds do not pose any danger to your unborn baby. However, if you experience severe nose bleeding in the final weeks of the last trimester, your hemoglobin level might drop and you can become anemic. 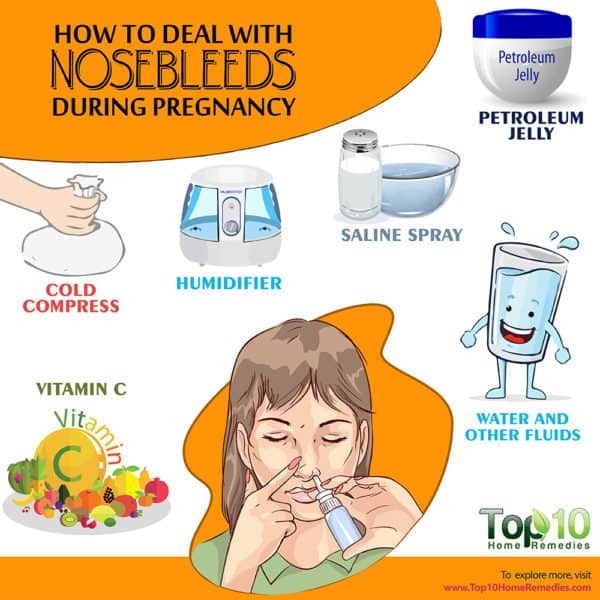 You should consult your doctor if you have severe nosebleeds late in the pregnancy. Nosebleeds are an unpleasant nuisance, but minor nosebleed episodes during pregnancy can be easily handled at home. Caution: Seek emergency care if persistent chest pain or labored breathing accompanies a nosebleed, or if you are bleeding profusely and blood is entering your mouth. Also when dealing with nosebleed, it is recommended to stay upright instead of lying down to reduce the pressure in the blood vessels in your nose, thus stopping further bleeding. Plus, do not tilt your head back or stuff your nose with tissue, and avoid swallowing your blood. Here are some of the best ways to stop and prevent nosebleeds during pregnancy. The easiest way to stop a nosebleed is by pinching your nose. This helps send pressure to the bleeding point in the nasal septum, which in turn stops the flow of blood immediately. Sit down and lean forward a bit, keeping your head higher than your heart. Using your thumb and index finger, pinch the soft lower part of your nose for about 10 minutes. During this time, breathe through your mouth. Repeat as needed until the bleeding stops. Caution: While trying this trick, do not lay flat, tilt your head back or put your head between your legs. Also, do not blow your nose. Applying an ice pack is also very helpful in stopping nosebleeds. The cold temperature causes the blood vessels to constrict faster and slows down the blood flow. This will help stop the bleeding within a few minutes. 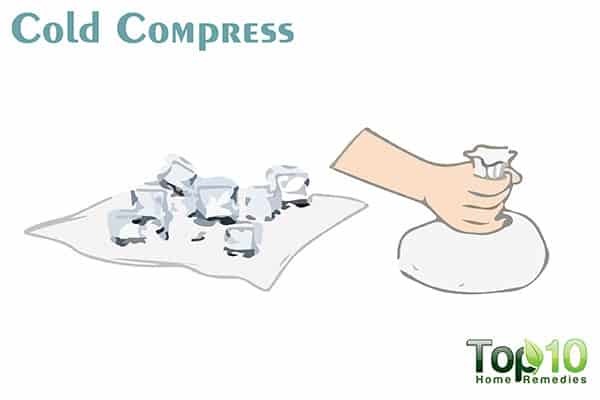 Apply the cold compress across the bridge of your nose for 5 to 10 minutes. A package of frozen vegetables also works well, as it conforms to the shape of your nose. Caution: Do not apply ice directly on your nose, as it can lead to frostbite. Drinking plenty of water is generally good advice, and it’s especially true during pregnancy. Water intake helps keep the body as well as the mucous membranes in your nasal passages well-hydrated. This in turn reduces the potential for nosebleeds caused by nasal dryness. Drink at least 8 to 10 glasses of water each day. 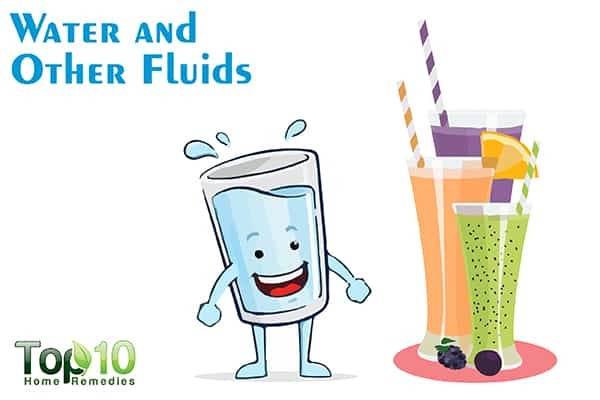 Apart from water, you can also have fluids like electrolyte drinks, sparkling mineral water, herbal teas, organic fruit juices or broth. Cut down on caffeinated drinks that contribute to dehydration. In fact, steer clear of your regular tea as it may contribute to nosebleeds. 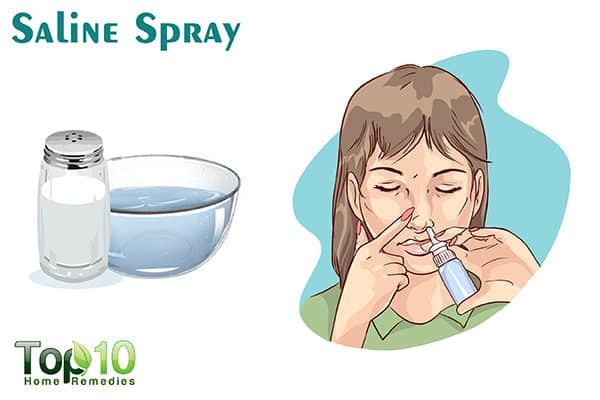 If you’re having nosebleeds due to nasal dryness, try using a saline spray to keep the nasal passages moist and prevent the problem. 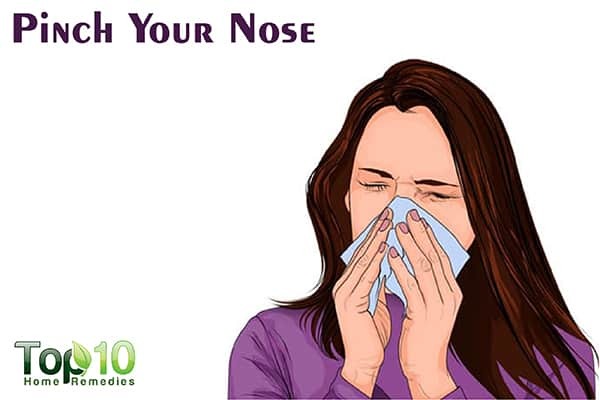 It will also help clear the nasal passages of irritants. Boil 1 cup of water and let it cool down. Using a dropper, put a few drops of the solution into one nostril while keeping your head tilted back. Inhale very gently to draw the solution further into your nasal passages. Do this a couple of times each day. A dry nose can make you more prone to nosebleeds. 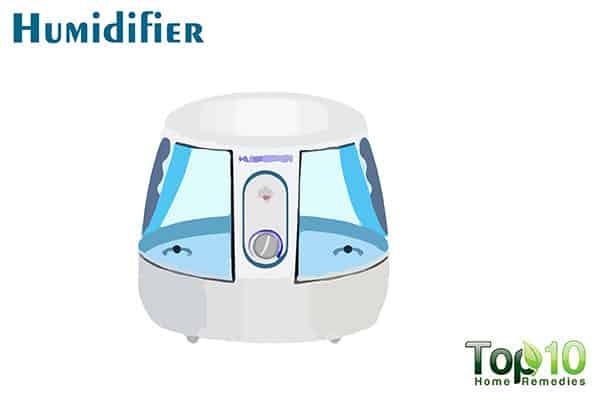 Using a humidifier in your house will keep the air moist and help prevent nosebleeds. In particular, use a humidifier in the room where you sleep to get rid of a dry nose and help keep your nasal passages moist. You can use a commercial humidifier or keep a bowl of water under your bed to add moisture to the air. Be sure to clean the humidifier regularly, and change the water daily so that bacteria do not grow. Increasing your vitamin C intake may also help. 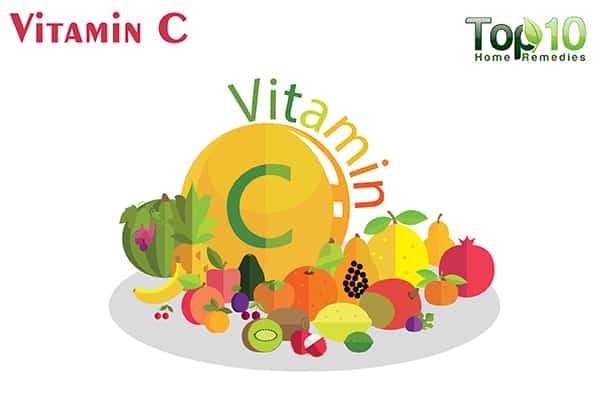 Vitamin C makes your capillaries stronger, which reduces the chance of nosebleeds during pregnancy. 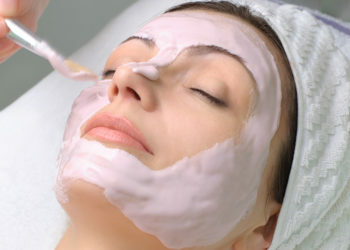 It also helps the body produce more collagen, which is essential for healthy blood vessels. Eat foods high in vitamin C, such as lemons, oranges, broccoli, grapefruit, kiwi, bell peppers, potatoes, strawberries, sprouts and tomatoes. You can opt to take a vitamin C supplement daily, but it is always best to consult your doctor before taking any supplement. To prevent nosebleeds due to dryness in the nasal passages, it is essential to keep the insides of your nostrils moist. You can do it easily with petroleum jelly. 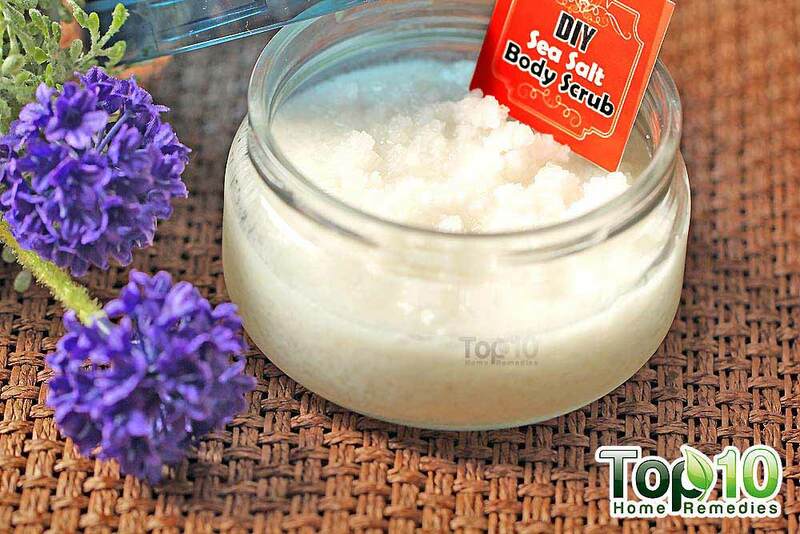 It is highly moisturizing, and will not irritate the nasal passages. Put a small amount of petroleum jelly on your finger and apply it on the inside of each nostril. 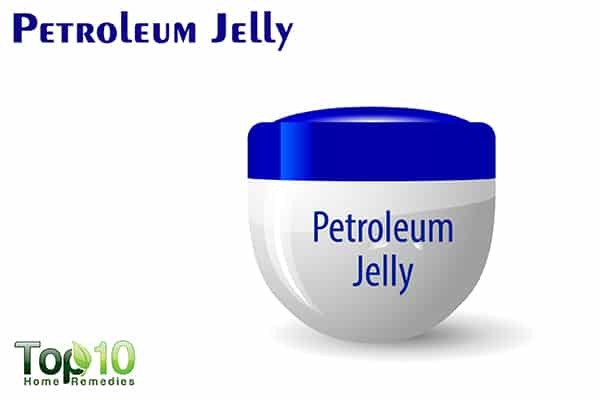 Note: Avoid using too much petroleum jelly at one time to reduce the risk of it being inhaled and swallowed. Avoid lying down or tilting your head back when you have a nosebleed. Avoid heavy or strenuous workouts if you’re experiencing nosebleeds. Do not pick or blow your nose. Avoid drinking coffee, as it may dilate the blood vessels further. Make sure your nasal passages do not get too dry, especially in the winter. Use nasal lubricants to prevent nasal dryness. Soften the inside of your nostrils by applying some coconut oil. Avoid secondhand smoke, as it can irritate and dry out the nasal passages. Stay out of smoky environments. Stay away from environmental irritants that can irritate your nasal passages, such as smog, perfumes and chemicals. Eat vegetables rich in iron to keep your hemoglobin level within normal limits and protect you from developing anemia. Nosebleeds During Pregnancy – Treatment and Prevention. American Pregnancy Association. http://americanpregnancy.org/pregnancy-concerns/nosebleeds-during-pregnancy/. Published May 19, 2016. Epistaxis of pregnancy and association with postpartum hemorrhage. Obstetrics & Gynecology. https://www.ncbi.nlm.nih.gov/pubmed/19935036. Published December 2009.